Day four of our east coast adventure found us waking up in our wonderful little room at the Port Inn in Kennebunk, Maine. If you go to this area, Port Inn is a great place to spend the night. We were anxious to get the day started and see what adventures Kennebunk and it's next door neighbor, Kennebunkport, had in store for us. About five miles separate the two towns. Or if a wooden moose rides by in the back of a pick up truck. We were especially eager to see what attracted President George H.W. Bush and his family to the area. Right away, we were struck by the incredible natural beauty. 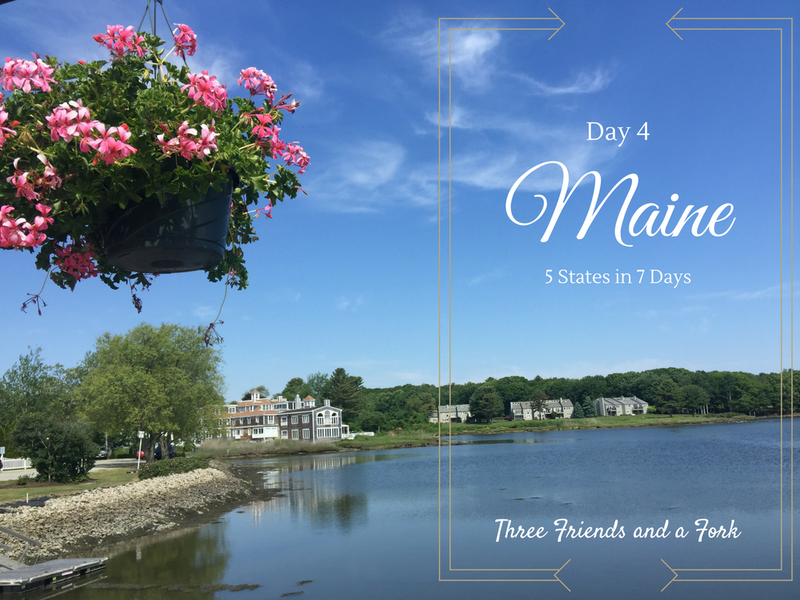 Kennebunkport is a darling little seaside town filled with cute shops and eateries. I was curious about a little dive called, The Clam Shack, whose lobster roll won the Travel Channel's Maine Lobster Roll Food Wars. The roll has also won the NYC Tasting Table's Lobster Rumble. The place may be small, but they are serious about lobster rolls. I waited outside the little building for the window to open up and was the first customer of the day. I was really happy about that because a line quickly formed behind me and got quite long. I ordered the lobster roll, of course, and also a cup of clam chowder. The person taking my order asked me if I wanted butter or mayonnaise or both on my sandwich. I was taken aback, because I had no idea. So, I asked her what she recommended and she said they always recommend both. Well, who was I to argue with the experts? I got both! While I waited for my food to be prepared, I grabbed a freshly squeezed lemonade at a stand in the outside dining area. When my food was ready, I found a weathered wooden picnic table outside under a bright red umbrella. I picked a spot where I could enjoy checking out the cute little town and watch people as they walked by. My lunch was delicious and perfect for the setting. The clam chowder was thick and full of clams. The lobster was lightly dressed and piled high on a soft potato roll. The lemonade was an ideal drink for my fresh seafood meal. The Clam Shack also has indoor seating. While I ate, I could hear someone inside being interviewed about the restaurant and how they prepare their lobsters. One thing that caught my attention was when the lady being interviewed said all the lobsters used at The Clam Shack are soft shell lobsters. She said the soft shells are a bit easier to remove and that there is water between the lobster and the new, bigger shell which marinates the lobster and makes them a little more tender. I really wanted to go inside so I could hear everything she was saying, but I was chicken, so I didn't. After lunch, I had time to shop and enjoy the scenery. You know you are in Maine if giant lobster claws are crawling out of the ground in front of a local restaurant. Kennebunkport is a port, so water and boats are everywhere. I loved the cute, rustic look of the shops along Kennebunkport's main street. I found this little candy shop called The Candyman, with homemade salt water taffy. I grabbed a variety of flavors for the road. Pots of bright flowers lined up outside the shops just begged you to come inside. We rounded out our visit to Kennebunkport with one last stop. You will find the name Rococo on almost any list of the best ice cream parlors in the country, so of course we had to check it out. With names like Banana Red Hot and Ginger Sour Cherry Jam, the flavors were not what you might expect. I had a hard time choosing, but eventually ended up with a combo of dark chocolate and salty sweet cream. It was cool, smooth and delicious. We left downtown Kennebunkport, but we had one final stop to make before heading to Bar Harbor. We just had to visit the beach. We could have stayed longer, but we had more to see, so we left beautiful Kennebunkport completely understanding why the Bush family loves this part of the country. Next time it is on to Bah Hahbah (Bar Harbor) for the rest of day four. In the meantime, Three Friends and a Fork give 3 Hum-dingah Yums UP to The Clam Shack, The Candyman and Rococo's Ice Cream.